BUDGET SINKS = Ship Via UPS   Budget Line Scullery Sinks 18” - 21” Wide Sink Bowls Are 14” Deep 24” Wide Sink Bowls Are 13” Deep Includes 3 1/2” Basket Drain & 8” O.C. Faucet Holes 1 COMPARTMENT SINKS 2 COMPARTMENT SINKS ** 24” x 60” ** 24” x 72” †** 21” x 48” ** 3 COMPARTMENT SINKS 4 COMPARTMENT SINKS     Cu. Ft. ”400” Series (430 S/S) ”600” Series (300 S/S)        Size L Wt. Model # Price Model # Price           18” x 18” 18” 44 lbs. 8 4-81-18 $981 6-81-18 $1126           21” x 18” 21” x 24” 18” 47 lbs. 53 lbs. 9 4-1-18 998 6-1-18 1162            24” 12 4-1-24 1016 6-1-24 1272    21” x 36” 36” 66 lbs. 16 4-1-36 1162 6-1-36 1308    24” x 24” 24” x 36” 24” 54 lbs. 12 4-41-24 1233 6-41-24 1363   36” 69 lbs. 17 4-41-36 1320 6-41-36 1455            91 lbs. 98 lbs. Cu. Ft. 21 ”400” Series (430 S/S) ”600” Series (300 S/S)          Size L Wt. Model # Price Model # Price           4-3-36 $1545 $1727  21” x 36” 36” 78 lbs. 16    21” x 48” 48” 4-3-48 1674 6-3-36 6-3-48 1982    21” x 54” 54” 24 4-3-54 1743 6-3-54 2034    21” x 72” 72” 115 lbs. 31 4-3-72 2255 6-3-72 2545   60” 108 lbs. 27 4-43-60 2181  72” 118 lbs. 32 4-43-72 2329 6-43-60 6-43-72 2454 2656                        Cu. Ft. ”400” Series (430 S/S) ”600” Series (300 S/S)   Cu. Ft. ”400” Series (430 S/S) ”600” Series (300 S/S)          Size L Wt. Model # Price Model # Price           21” x 36” 36” 73 lbs. 4-2-36 $1436 6-2-36 $1617  16    21” x 48” 48” 86 lbs. 98 lbs. 21 4-2-48 1564 6-2-48 1779    21” x 60” 60” 26 4-2-60 1982 6-2-60 2072    24” x 48” 48” 88 lbs. 22 4-42-48 1727 6-42-48 1908   60” 108 lbs. 27 4-42-60 2091 6-42-60 2364                Size L Wt. Model # Price Model # Price          24” x 60” † Quick-Drain Omitted In This Size ** Requires Two Faucets ** 21” x 60” 48” 95 lbs. 113 lbs. 21 26 4-4-48 $1855 6-4-48 $2144     60” 4-4-60 2364 6-4-60 2536    21” x 72” 72” 120 lbs. 21 4-4-72 2545 6-4-72 2729   For Residential Finish & Packaging, Add K-350 $343  Drainboards BudgET SiNk ACCESSORiES All Budget Sink Accessories Ship Via UPS Stainless Steel Sink Covers For One Compartment Budget Sinks    Model #  Size  Approx. Wt. Approx. Cu. Ft.  Price  N-5-818  18” x 18”  13 lbs. 1  $371   N-5-18  21” x 18”  15 lbs. 1   399 N-5-24 21” x 24” 18 lbs. 1  463 N-5-30 21” x 30” 22 lbs. 2  522 N-5-36 21” x 36” 25 lbs. 2  835 N-5-48 21” x 48” 28 lbs. 3  999  N-54-24  24” x 24”  20 lbs. 1   497 N-54-36 24” x 36” 25 lbs. 2  878 N-54-48 24” x 48” 30 lbs. 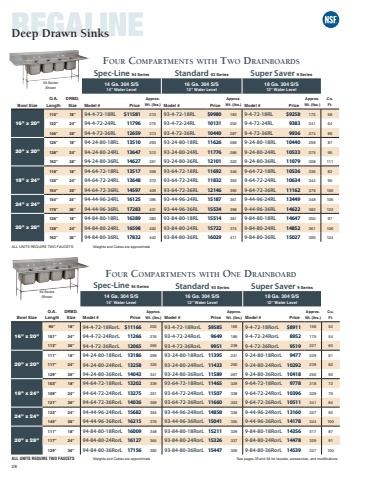 3  1040    Model #  Size  Price  LSC-81  18” x 18”   $416 LSC-24 21” x 24”  416 LSC-242 24” x 24”  416 LSC-36 24” x 36”  416  • Drainboards 36” & Larger Supplied With Legs • Sides & End Of Drainboard Turned Up with 2” Hemmed Edges Along Top Stores Conveniently On Side Of Sink  MOBILE & SOAK SINKS mOBiLE & SiLvER SOAk SiNkS   Mobile Sinks 34” Working Height A Multi-Purpose Unit. Move it where the ACTION is! A must for the large food preparation type installation. Silver Soak Sinks 20” Working Height UNIVERSAL BOWL SIZE. Accommodates 19 3/4” x 19 3/4” Dishwasher Baskets  Model # 9-FMS-20 9-FMS-12 Bowl Size 22” x 22” x 8” 22” x 22” x 12” Price $3819 4184 Approx. Wt. 50 lbs. 50 lbs. Model # 9-FSS-20 Bowl Size 22” x 22” x 8” Price $3649 Approx. Wt. 42 lbs. Silver Soak Sinks with Detachable Chute 20” Working Height Required for the Scullery operation that promotes clean sanitary flatware. Shown with Optional Bumpers    28 $4002 50 lbs. Optional Chute Optional Bumpers 9-SS-2 $208 9-SS-1 $441 Model # Bowl Size 9-FSC-20 22” x 22” x 8” Price Approx. Wt.